This is Part 1 in a series of stories (and tips) from our most recent road trip. Read Part 2, on Las Vegas, here, and Part 3, on the road to Flagstaff, here. We began our Spring Break Road Trip Extravaganza late on a Friday afternoon. The first leg of our trip was through California’s Central Valley, from the Bay Area to Bakersfield, a drive that we’ve made many times on the way to Southern California. We stopped, as we usually do, at the Apricot Tree to let the kids run around in the field next to the restaurant for a little while. 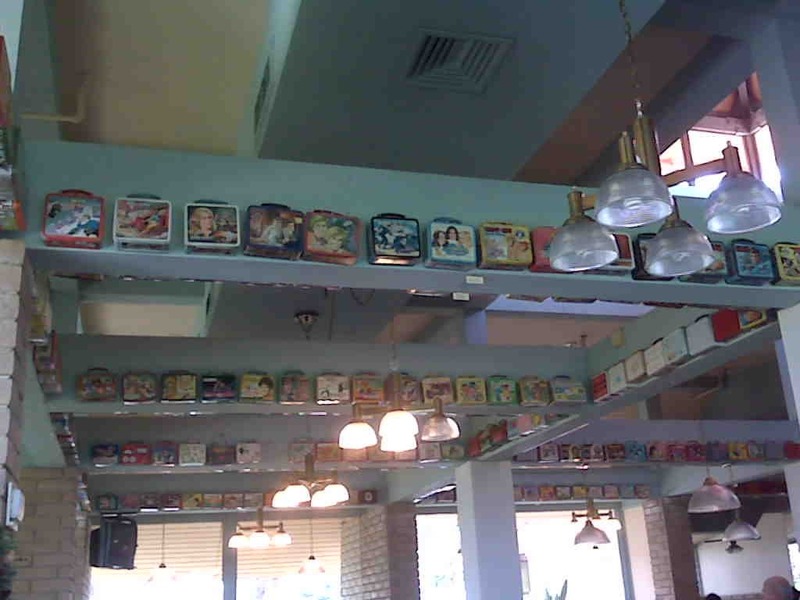 It was still a little too early to eat, so we didn’t go inside the restaurant this time, but it’s a cool place for a meal if you like to be surrounded by classic lunchboxes. After the kids were done running around, we continued driving as the sun went down. TRAVELING WITH KIDS TIP #1: To make good time, drive in the dark. To have a good time, drive in the daylight. In other words, if there are many places to see on the way to your destination, drive during the day; if not, drive at night so the kids can relax after a long day of using their energy up in an environment that isn’t your car. 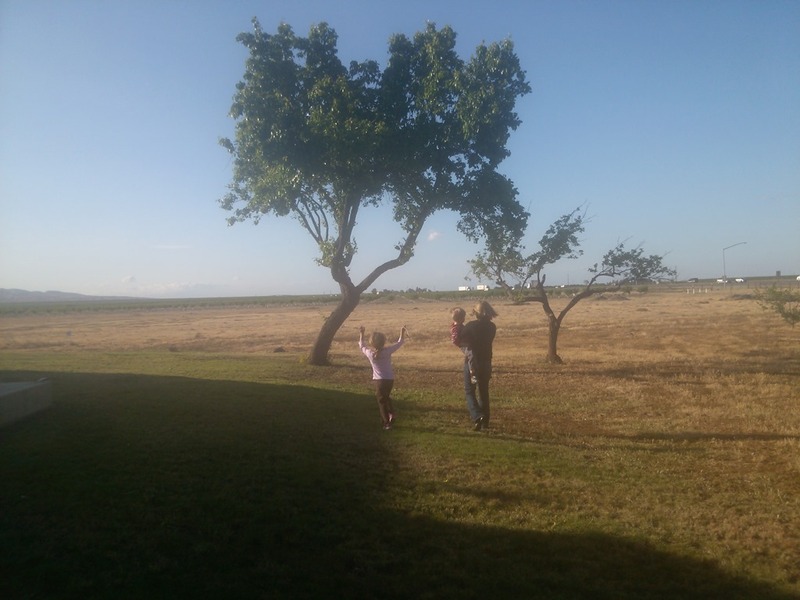 We drove through miles and miles of agricultural land and cow country (“Daddy, what’s that stinky?” Adrian asked through Coalinga, near a giant cattle ranch), and we rolled into Bakersfield after a quick stop for dinner. Why were we in Bakersfield? Honestly, we just wanted to split our trip into driving blocks of 4-5 hours, and in this scheme Bakersfield was a good stop between the Bay Area and Las Vegas. I don’t have anything against Bakersfield, but I didn’t see much of it beyond the hotel and the gas station. TRAVELING WITH KIDS TIP #2: The Embassy Suites and Homewood Suites chains are both owned by Hilton, and you can use your Hilton Honors Points to get free nights at these places. If you travel a lot, and happen to use Hilton, this is a good way to use your points since a suite at one of these places is not much more than a regular room at a Hilton. Most importantly, these hotels have rooms with separate living room spaces and you can set up some air mattresses in them (which is what we do), or use the sofabed. These hotels also include breakfast, often a hot buffet or even cooked-to-order items like omelets or waffles. Other chains of business hotels probably also have suite-style rooms as well, so find out what your favourite business travel chain offers for families, and try to make use of your points. One reason for breaking our trip up into increments like this was to make the most of our daylight hours for stops along the way. 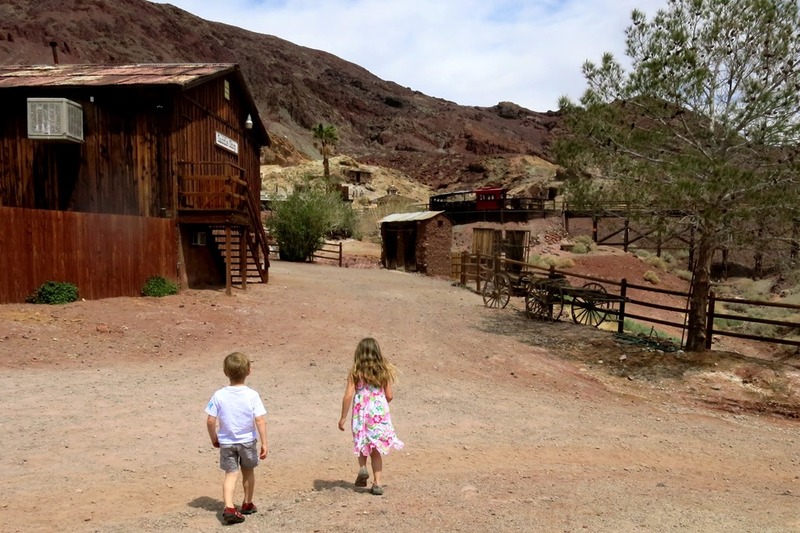 At about the halfway point between Bakersfield and Las Vegas is the Calico Ghost Town, an old silver mining town that has been preserved up in the hills above I-15. This would be a good place for a driving break, and lunch, and general touristy hijinks. 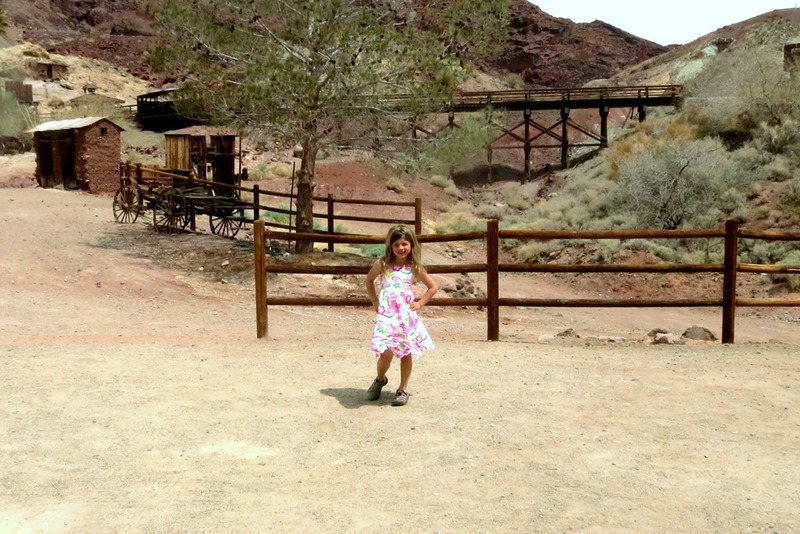 As dusty and brown as any movie scene in any western, the Calico Ghost Town was a perfect stop for our gang of wagon-trainers. We ate lunch at the barbecue restaurant, sitting outside in the air while a tour group of French seniors organized their visit a few tables over. 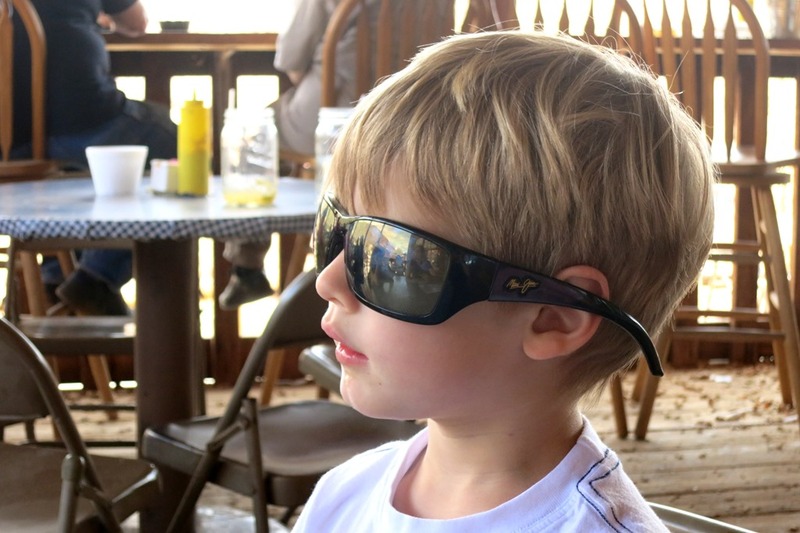 The kids took turns trying on my sunglasses in between bites of chicken and fries, while I sipped on sarsaparilla. 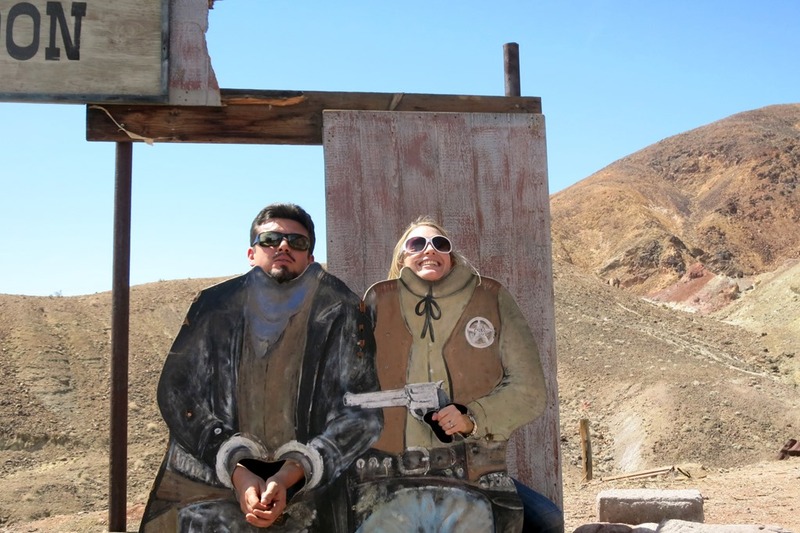 We found some cutouts to pose with in front of what purports to be an old saloon. There were chairs located behind the cutouts to make it easier for kids to get their heads in the picture, but note the view of Adrian’s feet where his manacled hands should appear. 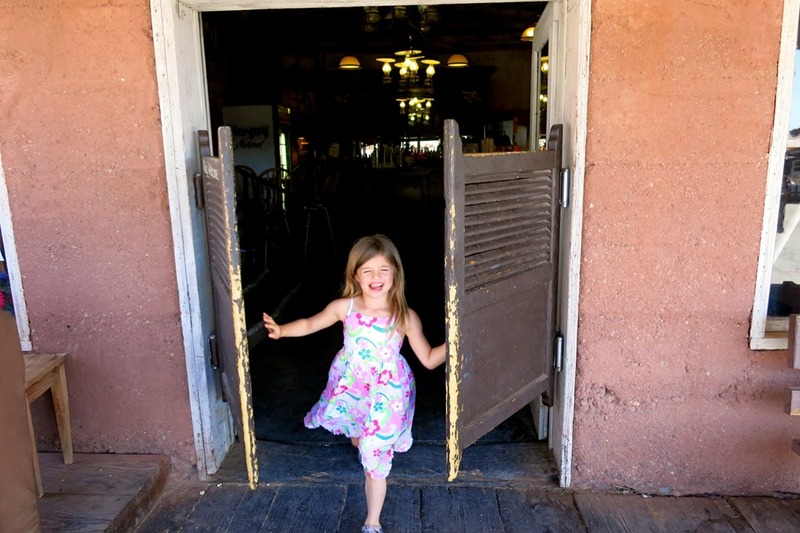 Just up the road, a recreation of an old saloon offered the kids the chance to burst through swinging doors, as though they had just been deputized and were being called out to save the town from bandits. The saloon also gave me a chance to teach Adrian how to play poker, though we used the bottle caps in the trays instead of real money. 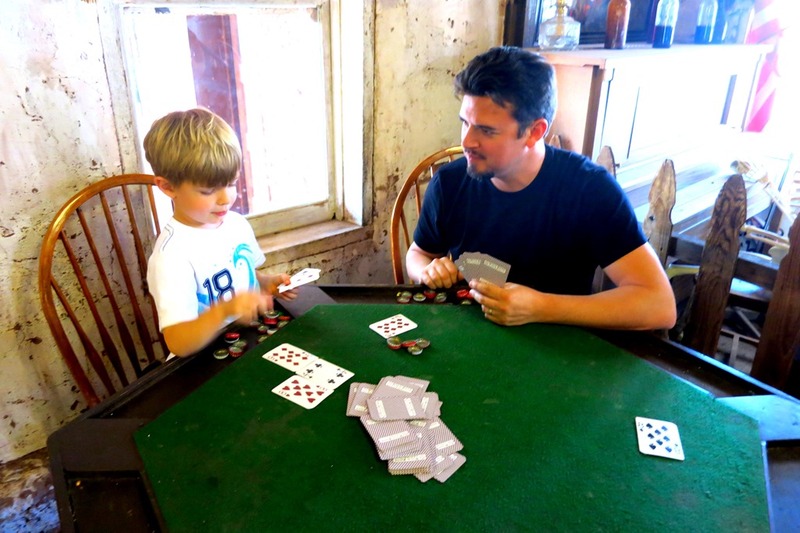 I’ll wait until he gets an allowance to teach him how to lose at poker. 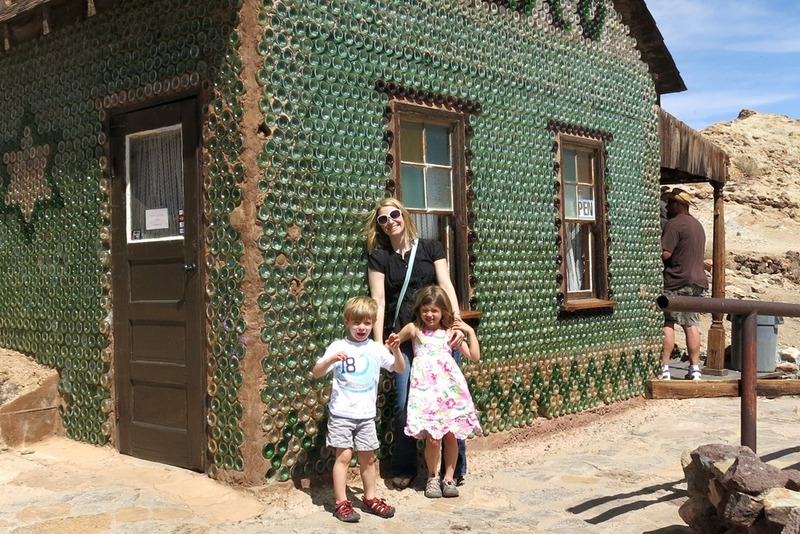 Among the hills on the outskirts of town sits a building walled with translucent glass bottles. Try to guess what this building is used for. Did you guess that it was a pet accessory and treat shop? Wow. Good guess. If you’ve ever been to Santa Cruz, you are probably familiar with its famous Mystery Spot, a location in the mountains that seems to defy the laws of physics, where water runs uphill and perspectives are flipped about. 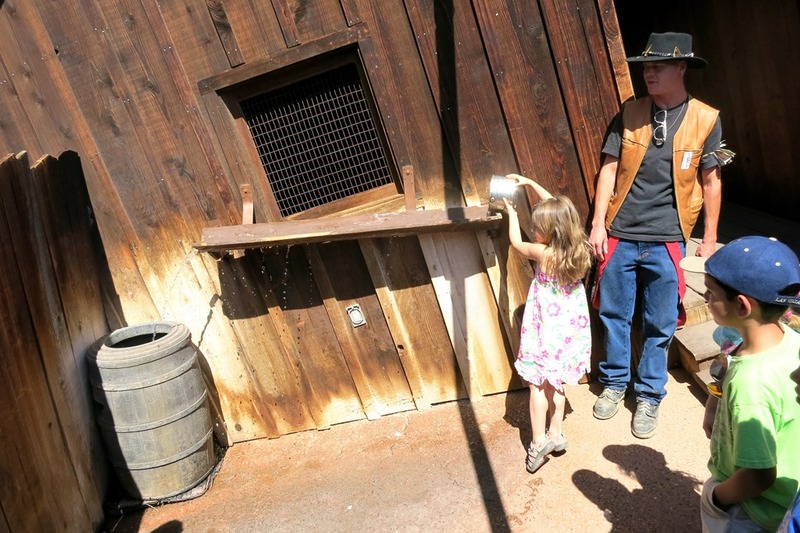 There is a Mystery Shack in the Calico Ghost Town, where similar perceptual confusions are on display. Erin had a chance to make water run uphill (though in the picture you can see the actual direction it took), run up and down walls, and try to get out of the magical chair. The kids were also able to pan for gold dust in a long trough. 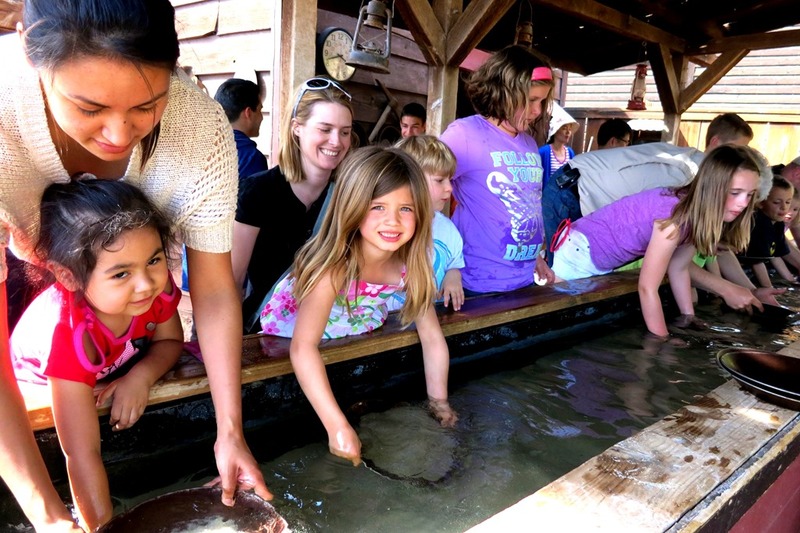 Although Calico was a silver mine, no Old West experience is complete without panning for gold. We rounded out our visit with a ride on the mining train, and stops in various book and gift shops along the way. Erin had promised her school’s librarian that she would return with books from the places she visited, so we made sure to find a small one that explained some of the history of Calico. The kids also left with some plastic eggs with toy dinosaurs inside. I’m not entirely sure why. Finally, before we left, we took advantage of the facilities, then got back on the road. Onward to Vegas! TRAVELING WITH KIDS TIP #3: Use these stops as opportunities to not only see some sights, eat food, or use the restrooms, but also to refill any water bottles you have with you. Don’t get stuck on a long stretch of road without anything to drink. Awesome tips! We’ve taken 3 road trips this year…ann tips are welcome. 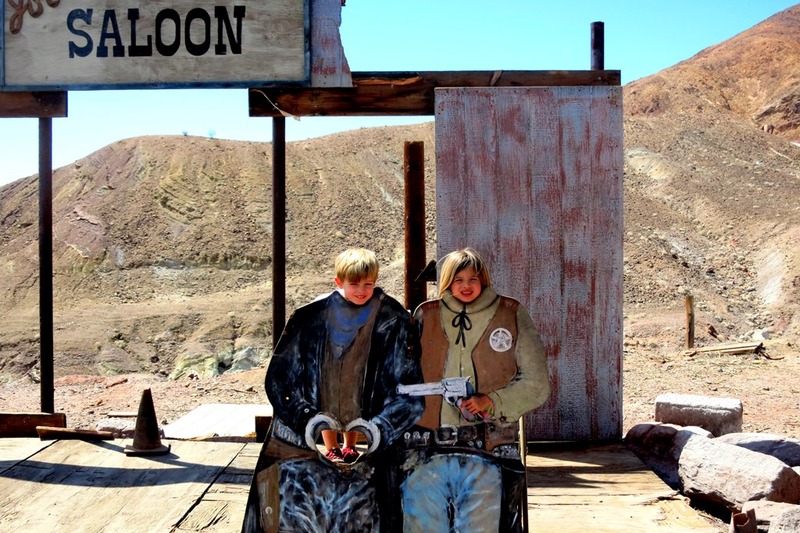 The ghost town looks like a lot of fun! Taking another trip in August to Long Beach (from Boulder, CO). Love road trips if we are not rushed! Cool pics! That area looks really neat.